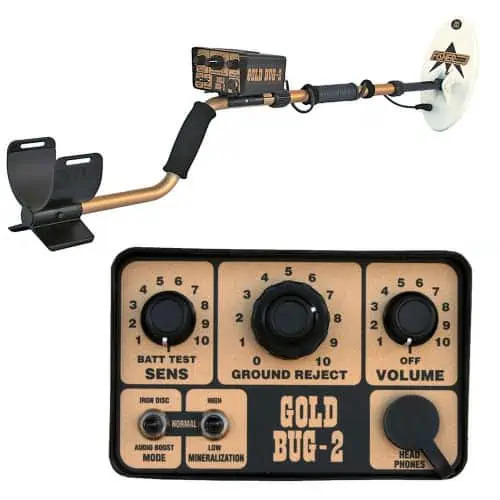 If finding gold is all you want when you use your metal detector, there are models that are certainly better suited for searching for buried gold treasure than others. 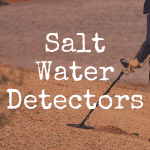 And in this article, we’re going to discuss not only the best ways to go about searching for gold, but give you a handful of recommended metal detectors most suited for this task and discuss why you may (and perhaps may not) want to purchase one of them. And below, please take a look at our interactive table to easily compare some of the best metal detectors for gold hunters. You can compare the detectors based on key features, price, weight and more. Minelab SDC 2300 5.1 lbs. 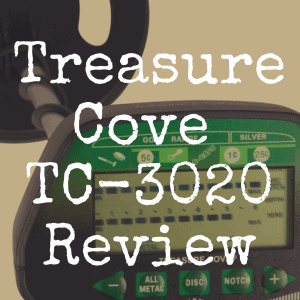 $$$ 5.0/5 Gold detector; Submersible to 10 ft.
How Do Metal Detectors Find Gold? Metal detectors have been used for hundreds of years to discover metal in the earth, but only in the last few decades have the models been able to distinguish gold from other metals. A detector has a coil that produces an alternating current that goes through another coil and produces a magnetic field. When the detector is near metal, these currents flow into the metal and another magnetic field is created. The coil on the metal detector can sense this other field and will indicate that metal is near. 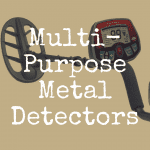 With the invention of the pulse induction metal detector, it became easier to find gold among other junk metals. This type of detector just shoots a high voltage signal into the ground. When metal is there, the rate that pulse decayed was different and the detector could identify what type of metal was buried. Metal detectors could search deeper and be customized to only signal when gold was found. One thing to remember when you begin to search for gold with your metal detector is that most machines will not be productive unless you are hunting in an area that has gold nuggets. Nuggets are considered anything over a half a grain in size and how big of a nugget you may find depends on how deep the gold is. A larger nugget can be spotted much deeper, while a small flake needs to be closer to the surface for your detector to be able to find it. Fine particles of gold can’t usually be spotted using a metal detector. 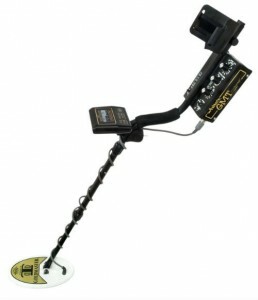 This model has many features that make it easy to use and earns our top spot as the go-to gold finding metal detector. It is very lightweight and has a huge ten inch coil, so you can search larger areas at once swipe. This model also offers course and fine ground reject controls. With a frequency of over 70 kHz, it can detect smaller pieces of gold easier and it also has low, medium and high mineralization options so you can adjust the level to whatever ground you are searching. You can also set the detector to reject any type of iron or hot rocks you may scan over so you don’t keep getting tones for metal that you don’t want. The dual-knob ground balance adjustment lets you maintain the effectiveness of the machine in different conditions. them to where gold is often found. The frequency of this model is only 48 kHz, but it does have an iron target analyzer and an elliptical coil. All of these features make it a great gold detecting model that lets people using it find gold deposits and avoid the unwanted metals. It comes with an instructional DVD and it is very easy to use. Garrett is a wonderful brand of metal detectors and is one many people check out first when looking for a new metal detector. The AT Gold is a very high-quality machine that many gold prospectors like. Its All Metal mode is very sensitive and this makes finding gold at greater depths easier. The AT Gold also has a target ID system to analyze the properties of an object so you can easily ignore anything but the gold you want. When the detector indentifies a ferrous metal, it gives off a tone so you won’t miss any gold as you scan. High-resolution iron discrimination, pinpointing and automatic ground balancing all add to the ease with which you can use this model and find gold easily. One of the features that draw so many people to this metal detector is how easy it is to use. The controls are easy to see and understand and it is very lightweight. The coil is a ten inch elliptical and it has a 17.8 kHz frequency. With all of these features, this detector is also great for people who want to find more than just gold. Another feature of this model is a sensitivity toggle so the user can easily see what depth the object is at. You can also set the detector to only find certain types of metal so you can ignore anything but gold, if that is what you are searching for. This is the most expensive gold metal detector on our list. 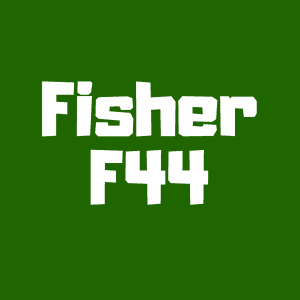 At a cost of more than $5,000, it does offer many features that the lower priced models do not, but many of the features are ones few people really need. It is the most technological detector that makes even the smallest piece of gold easier to find. The GPX Series can be adjusted for any type of ground so it can be taken to any area fairly easily and it offers six preset search modes so you can quickly pick what you want to look for and start your search. This model can search much deeper for metals than most of the other models and even in the worst ground conditions. It is also very easy to use for beginners and has enough features to keep even the most dedicated hunters satisfied with it. Bonus Option: Consider reading our review of the very aptly named Bounty Hunter Gold Digger. Any of these models might also be considered one of the best metal detectors for jewelry. If you are only searching for gold nuggets or flakes, you will have to carefully watch how big your object is before you start to dig. Before you purchase a metal detector that will only search for gold, make sure you don’t want to look for anything else. If you think you might want to search for coins or relics, check for a detector that will allow you to change the settings and look for other objects. If you enjoyed reading this in-depth article, please “like” our brand new Discover Detecting Facebook page! 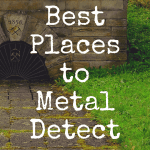 For more articles on metal detectors, be sure to bookmark our homepage! 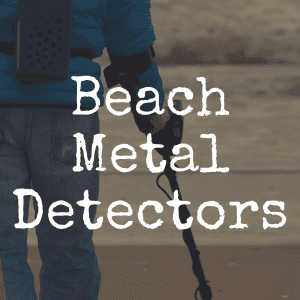 What’s the Best Metal Detector in 2015?